You're in the right place if you want to play casino slots online. Lend your slot spinning hand to a cute, impish pixie girl whose only desire is to guide you through a fairytale world filled with gold coins, pirate ships and the chance to win up to 100x your original stake. Read more below tohow to play online slots like this one. Following their foundation in 1997 Eyecon gaming eventually moved into the casino and slot game market in 1999, developing games like Temple of Isis to the forefront. Eyecon has developed a reputation for bringing only the best online slot games platforms and this is evident when you look through their extensive repertoire that boasts games like ‘Isis, Fluffy Favourites and now, Twinkle. 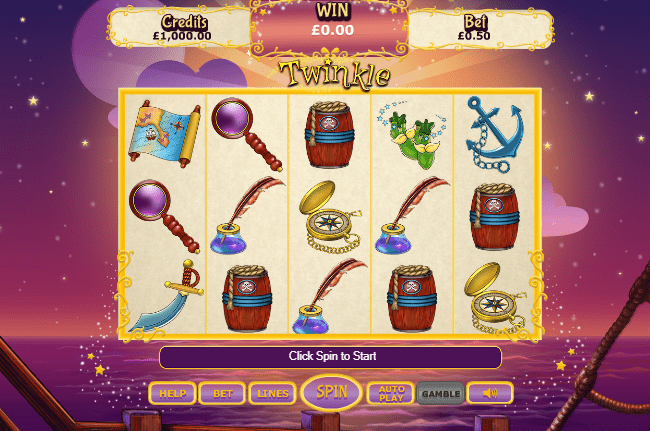 Hop on board the pirate ship to Neverland, join Tinkerbell and the gang when you play one of the best UK slots, Twinkle. If you hadn’t already guess this online slot is loosely based on the exploits and adventures of Tinkerbell and the boy who never grew up; Peter Pan. In terms of the gaming structure, it’s a pretty standard affair with 5 paylines, 3 rows and a healthy 25 paylines for you to delve into. 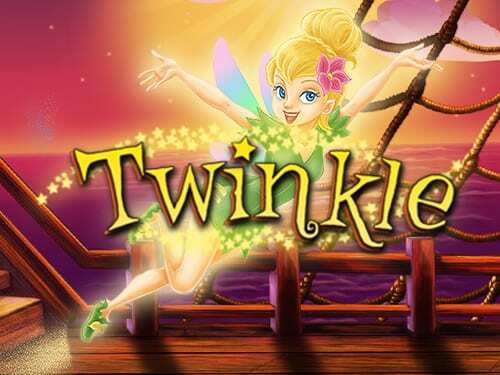 As previously mentioned this game has a certain Peter Pan feel about it, and you will join Tinkerbell to sail the reels and earn yourself some wonderful cash prizes. Aesthetically, the game has a very ethereal, enchanted forest feel about it that does its best to transport you to another world, another world where your only worries and considerations are how you’re going to secure those juicy free spins. You can’t truly say you’ve lived and breathed this game until you’ve experienced the wonderful soundtrack that creates a comforting yet mysterious gameplay journey. The game board hovers above a traditionally animated pirate ship that has dropped anchor in the harbour, you must spin through the reels and match barrels, swords, compasses, magnifying glasses and more to link up paylines and treasure maps to earn your fortune. Gamers should look out for the jar icon to trigger the prize pack. The prize pack is a common feature of Eyecon games as they like to give the gamer some additional side features to draw them away from the main reels and give the gamer that added bit of excitement. Match 3 of these jar icons and the prize pack will be triggered, enabling you to choose for yourself your own fate and save the fairies from Captain Hook’s grasp. For every fairy that breaks the grasp, your winnings will be multiplied by as much as 100 times your original winnings. The more jars, the more choices and picks you get at rescuing the fairies. And we all know what that means. More money! 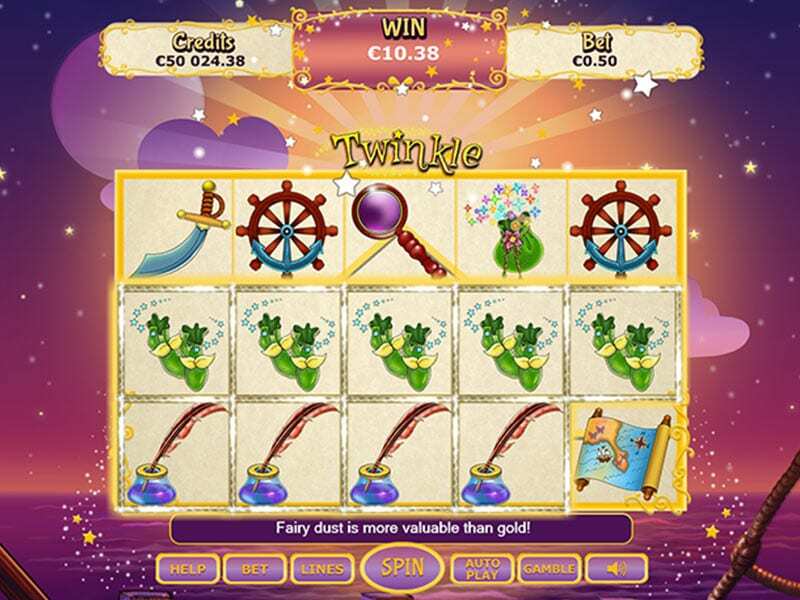 In addition to this, when you stumble across the Twinkle Scatter icon all of your dreams will come true when you discover you’ve been awarded a sumptuous 25 free spins. Once you unlock the gamble bonus you will be able to choose fairies in an all or nothing side game to see your fortunes skyrocket, or plummet. Click here to discover more about the Wizard's promotions. 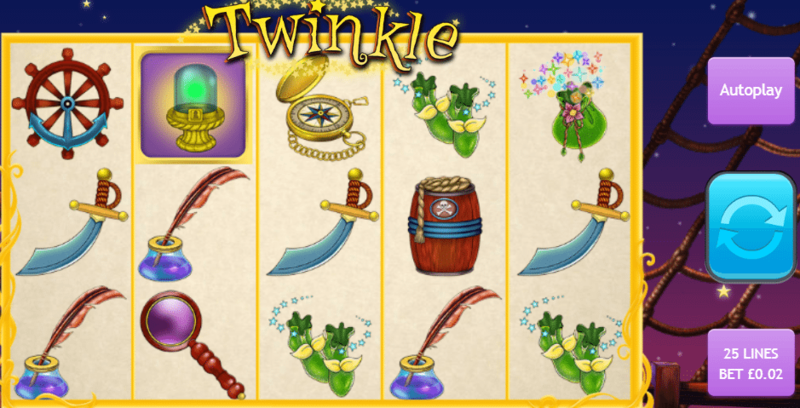 There’s no wonder why Twinkle is an extremely popular online slot game. If you look at the simple aesthetics of this game, the colours, animations, along with the highly relatable and traditional Peter Pan theme you can see why gamers keep coming back to this one. Twinkle is an online slot that really makes you feel good. In respect of all this, there are loads of great bonus features and free spin options that can be attained, and that alone is a recipe for success. This is perhaps one of the best games out there at the moment and Wizard Slots rates it highly. 10/10. Another 10/10 game is our fluffy too slot.